I confess that I avoided picking up a copy of this book (published 1910) on quite a few occasions. It just looked like something that was going to be cheesy and not quite as endearing as Wind in the Willows(published 1908), but a desperate attempt to be so. However, when presented with a copy at the library book sale for $1, well, how could I pass that up? I was correct, by the way, in assuming that it wouldn't be quite so cute as Wind in the Willows. But that'd be hard to touch. 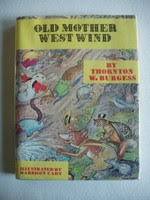 Old Mother West Wind, one of Burgess' numerous animal stories involving characters like Jimmy Skunk, Johnny Chuck and even Peter Rabbit, doesn't really come close to Beatrix Potter's Peter Rabbit either. All the same, I did enjoy this book and am glad I picked up a copy. I imagine that it'll be a fun read-aloud book when the kids are around the ages of 6-9. It's cute, it's clean and it's about animals. What's not to like (on the surface)? Still, it seems like a rip off of Potter. Potter's Peter Rabbit made his debut appearance in 1902 and Burgess' version didn't appear on the scene until 1910. I could not find one online source that would discuss the differences between the two rabbits, although I do find the situation curious. Both Potter and Burgess created their tales because of an inner love of nature. Burgess developed his animals through a series of bedtime tales that he told to his son. Having grown up loving the outdoors, he wanted to pass along that love to others and eventually landed a syndicated newspaper column titled "Bedtime Stories" in which his characters lived. I don't know. I think Potter's stories are more classic and charming. At the same time, I enjoyed Burgess for his moral tales. There's a lesson to be learned in almost every story. That aside, I think he stole from Aesop a time or two and I find even that disturbing. I don't find myself able to get behind Burgess and support his stories in the same way I do Aesop or Potter. It just feels like these stories have been told. I did like the book superficially and I think it's a perfectly fine and good story to share with the children and I plan on doing so myself. It's a cute book and charming but not necessarily "in its own way." It feels borrowed somehow. The American-ized Peter Rabbit. Which I just don't really like. If anyone has anymore information on the comparison between Potter and Burgess, I'd be really interested in hearing it. Do share! I'm curious. I'm not saying "don't bother with this book." I think it's worthy of consideration although I do wish there was more information available critiquing Burgess. Something just feels wrong and I can't say why just yet. So for now I'm saying, "If you are looking for something to read to your tykes - don't be afraid to grab this! It's cute." And that's all I can say. Interesting. I have a soft spot for Burgess, having read many of them when I was a kid. They're certainly not first-tier children's literature, but I do think they are good early-reading fodder (for children whose minds have not been numbed by limited vocabulary stories). They're a little obviously preachy for my taste, but that age of children tends to like things well defined. I've never considered them as a Potter knock-off; I don't think anyone would be so obvious as to borrow the name and have a quite different character. 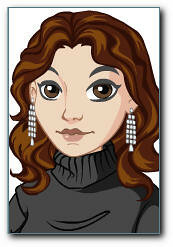 (A borrowing writer would borrow the character and change the name--much less effort and less obvious.) Probably the Potter books were not widespread in America while Burgess was initially inventing his characters. There's no shame in being derivative. Especially not of Aesop--most of western literature is borrowed from the Greeks. :-) Finding an original idea in literature is always a great moment, but if the greatest among us can borrow shamelessly (e.g. Shakespeare), why shouldn't the second-tier writers do it? I agree with you that MOST stories today (and throughout time) are derived, most certainly from a moral standpoint, from The Greatest Story Ever Told. There's no escaping *that* particular truth. It is increasingly difficult to be original in every respect. I didn't clarify on what was Aesop-like so as to explain my annoyance. Burgess wrote a story called, "Spotty the Turtle Wins the Race." Granted he had *three* other animals racing against the turtle, all of which failed to win the race, but still. It's too blatently obvious which got under my skin. I don't have anything profound to say, just that Burgess has found a huge welcome in our home. My oldest son was crazy for these! I started off reading him a few and then he went on to read almost all of them up until he was 10. My youngest son, now 7, is really enjoying them as read-alouds and I plan to have him read them himself when he's ready. But it's interesting to get your very different take on the stories. I too have a soft spot for Burgess, but Potter is still my all time favorite and doesn't hold a candle to Burgess. I like the language of Potter better, but Burgess is better for kids to read themselves. I will say that you didn't pick a good one to start with. That one is my least favorite. I don't like his short story books. The one thing I find Burgess does that Potter doesn't is integrate more of the animal characteristics, habits, and habitats into his books. Try reading "The tale of Bob White, Sammy Jay, Paddy the Beaver or Happy Jack Squirrel. These are complete books about one animal and are part of The Green Meadow series. These are much more enjoyable and educational, and not so Aesop like.